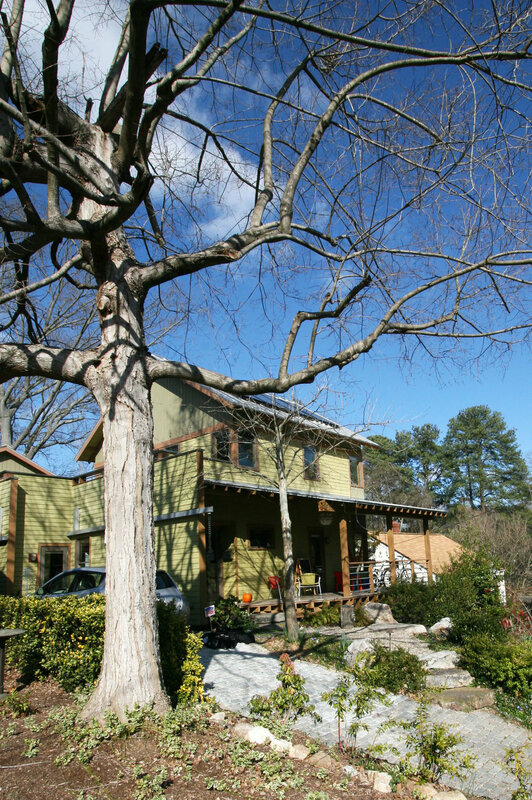 A green infill project in one of Raleigh's oldest downtown neighborhoods, the Martin Residence is carefully configured to take full advantage of its tight city lot. By opening up every indoor space to an outdoor one, it allows interior spaces to feel bigger. With a porch in front, patio in back, and rooftop terrace above, it invites an easy lifestyle of casual indoor/outdoor living that is possible here in NC. It features: SIPs construction, geothermal heat pump, solar hot water for radiant heat and domestic use, rainwater collection, recycled materials (heartpine flooring, glass tile, milk jug decking ), Hardiplank siding, local pine trim, native, drought-tolerant landscaping, and efficient space design. Lastly, the walkability of its location allows virtual car-free living for the Martins. Though it introduces new elements and technologies to this street of 1920s bungalows, it continues key patterns common to its older neighbors, such asgenerous streetside porches. Kitchen/dining/living open onto a patio with stairs to a rooftop terrace, connecting private backyard to public street. This offers a rare opportunity to be among the rooftops and survey the street below, and enjoy liberating views of the park beyond. 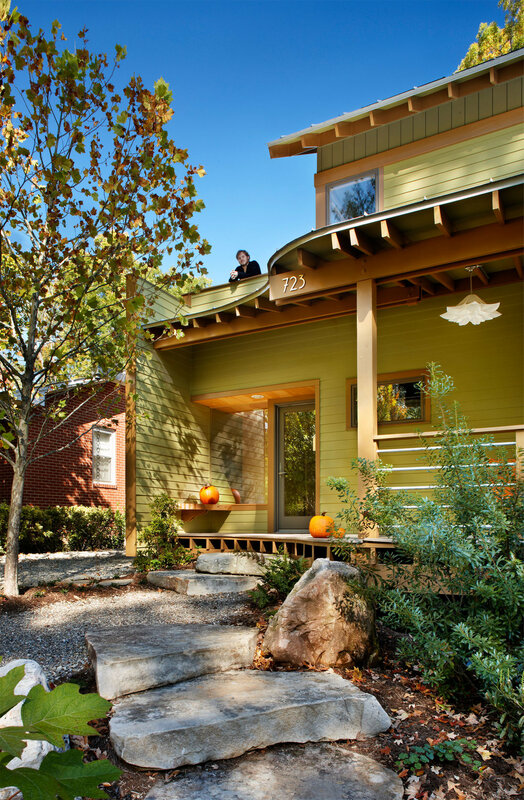 Designed around two existing trees, the front porch curves in deference to the "Entry Tree." Connected visually inside, one tree "sees" the other through large openings framing their trunks at either end of the house. 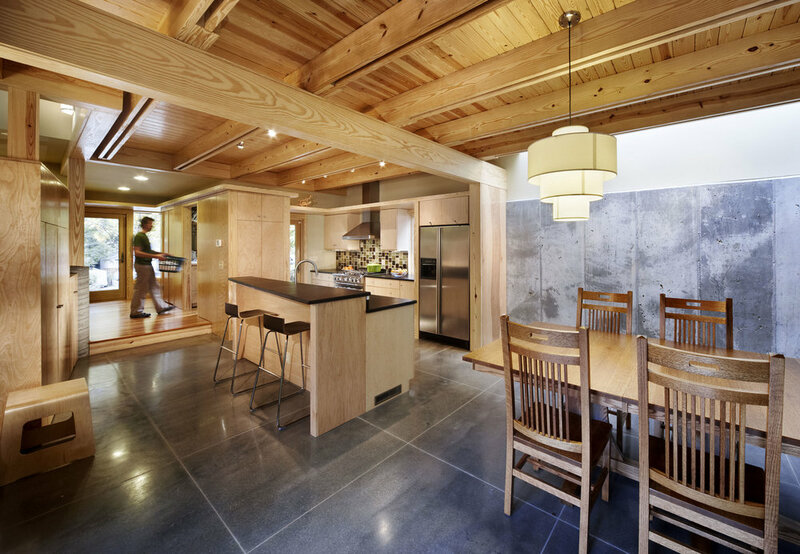 With more expansive views to the east, a continuous, poured-in-place concrete wall shields the house from close-by neighbors and higher grades on the west. Outside, gutters ride atop this wall, feeding an 1000 gal. cistern underground. Inside, the wall is washed by a skylight, marking the path of the sun in the space below. At night it becomes a lantern, illuminating the roof deck with a gentle glow. 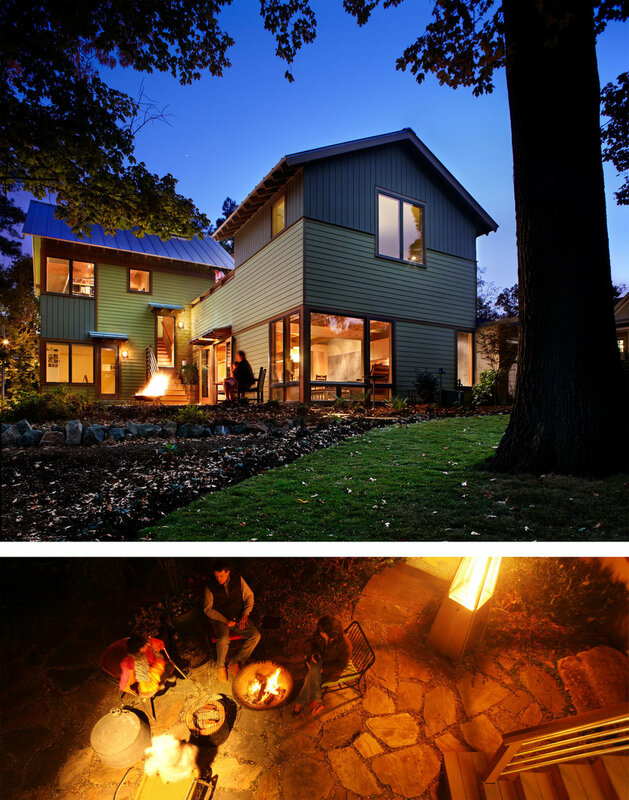 Featured in the March 2013 issue of WALTER magazine: "SMALL AND CLEVER: The Martin House Thinks Big." I Selected for the inaugural 2010 Triangle AIA Home Tour I Featured in Fine Homebuilding's 2010 HOUSES issue: "The Modern Bungalow" I Selected as the News and Observer's 2009 Home of the Month: "Surprising Spaces" I Featured in Architectural Record's Green Source magazine I Documented by the Discovery Channel's Planet Green network in a series of five TV episodes.